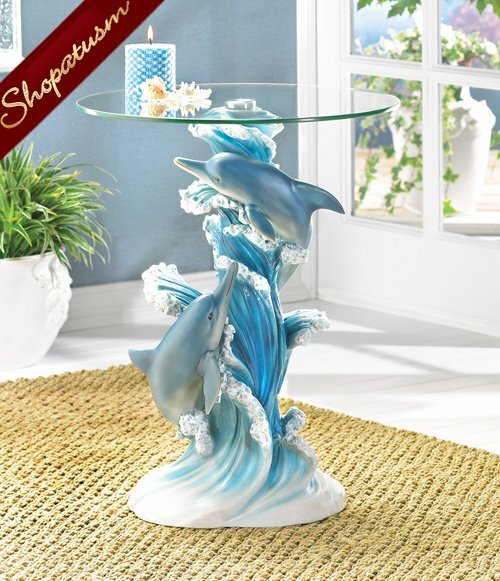 This is for a dramatic playful dolphins statue end, hall, accent glass table from Shopatusm. Enhance your decor with a statuary table of incomparable artistry! Lovingly sculpted column base perfectly captures a dolphin pair's light-hearted joy and exuberant grace as they play amongst the foaming waves. Flowing lines and intricate details combine to create a stunning work of functional art! Polystone base; glass top. 19 inch diameter x 24 1/8 inch high.